To truly understand Athena, one must understand her birth and vice versa. Here I will explain her birth, if you want to learn more about the Goddess, you must visit her page. The story of her birth begins with her mother. Metis, the Goddess of Prudence or Craftiness and a Titaness, was very much the apple of Zeus' eye. The two were sort of married, and they definitely played around for a while. Zeus wanted a child at that point, but then he heard from the oracle that he was going to have a son that would dethrone him (as he had his father, and his father had his grandfather). He didn't like that so much, and so even though he went on to have many more sons, he feared that the son of a union with Metis would bring his destruction. So, while the two were playing one day, Zeus proposed a game of changing shapes. Metis forgot her Prudence and decided it would be fun. They changed all sorts of shapes, big and small, but when Metis changed into a fly, Zeus swallowed her. She spent the rest of their lives giving Zeus advice from inside him. I don't know if he thought that swallowing Metis would nullify her child, but it certainly didn't. Zeus probably thought that was the end of that, and for a while it was. But one day, Zeus was just chilling by Lake Triton and he started to get the worst headache of his life. I mean, we are talking deathly migraine here. It was so bad that he called for Hephaestus and had him split open his head. 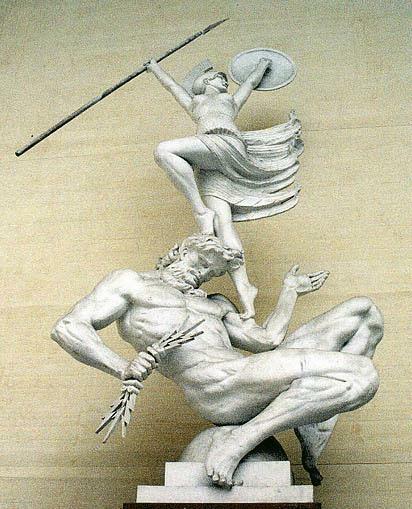 From the split leapt Athena, leaping into the air fully armored with a war-cry. And that is how her priests (and Hesiod) say she was born. Other versions peg her father as Pallas (who later attempted to ravage her and she killed him without hesitation and took his name and skin), but this story is unlikely since Pallas was a giant with a name that meant "Maiden". Some say her daddy was Itonus, a King of Iton. Some say her biological father was Poseidon, but that she begged to be adopted by Zeus. No matter what the story is, she never has a real mother. Athena's birth "is a desperate theological expedient to rid her of matriarchal conditions" says J. E. Harrison. She was the Goddess of Wisdom, and the daughter of the Titaness who basically personified it. By having her born only from Zeus, it gave males authority and power over something that had previously only been a female realm. Zeus swallowed Metis, and so he did not lose wisdom, but made it a part of himself. Likewise, the Achaeans suppressed the Titan cult and said wisdom was only with Zeus. Athena could be free of the bonds that tied her with a mother. She did not have any loyalty to a mother figure. That played a big role. She described herself as misogynist but would not have been able to take that role had she had a mother.